Coleman Rocky Mountain 5 Plus tent is a nicely built family camping tent with 3 rooms, PVC windows and an impressive waterproof rating of 4500 mm. It provides more than 11 m² (120 ft²) of the fully protected area. Coleman Rocky Mountain 5+ Tunnel Tent – 5 Person. 4 PVC + 1 mesh windows. First, note the 5 Plus in the name. This is probably to make the difference between this tent and yet another which is without ‘plus’ in the name. There is a big difference in the living room design; this Plus tent is with the front brim (awning) above the only door, you can see it in the picture above; the other tent has two doors and the front side is angled and without the brim. But they have made a bit of a mess in the description. For example, the floor plan below shows the side door which does not exist here, and there is a problem with the numbers as well. So do not get confused with all this, you will see the tent in the video below, and this is the Plus version. The tent is a tunnel-type with 3 rooms. This includes the large living room plus two sleeping units separated by a removable divider. 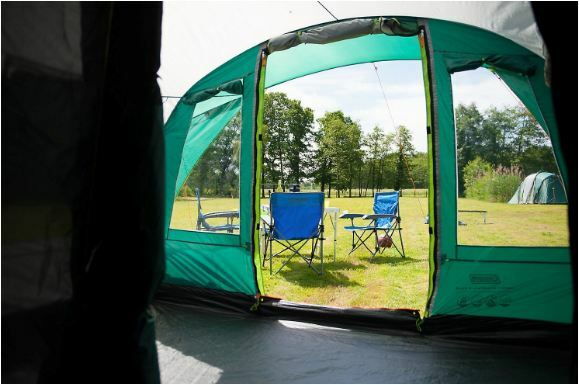 Such tunnel tents are not freestanding so bear this in mind when you buy it and when you choose your camping area. It must be staked down properly. The tent is full of features and you will see them described below. Here to stress that the sleeping area is a tent within the tent, so this is a double-layer zone, while the living room is a single layer area. Due to this design, this tent is the winner of the 2017 Camping Magazine Editor’s Choice Award. This is closely related to the blackout design. Due to such a dark area, they claim that the bedrooms are up to 5°C cooler during the day while during the night they are up to 1°C warmer. The former looks good but the latter, well, I think it is not worth mentioning. They claim independent laboratory testing which proves that the fabrics used in the tent construction is with the SPF 50 protection level against the sun’s ultraviolet rays. This is something really worth mentioning if you are in the situation to camp in an exposed place. Several nice features: the PVC window, dark rest rooms with the divider, multiple storage pockets, and the back mesh window. Capacity-wise it is declared as a 5-person tent, so let’s see what it offers. The dimensions are shown in the picture above and from this you realize that it provides 133.5 ft² (12.4 m²) of the inner area. This means 26.7 ft² (2.48 m²) per person. So this looks quite generous. 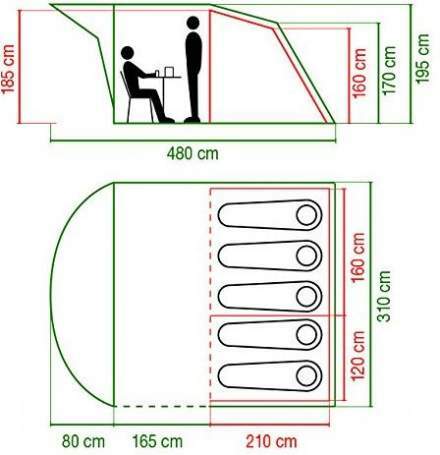 Note that the tent’s ground length is 4 m and not what the lower picture shows. Note also that the inner tent is separated from the shell and this takes some space, so the effective area is around 11.2 m² (120.5 ft²) and this is close to the number which they give on Amazon. But when you see the sleeping area, you realize that it is too narrow for 5 people. It allows for the very narrow pads in the range 50 – 60 cm. This is a pity, but you have such a situation in many tents of this type. So in spite of so much space, I would say that its sleeping area it is for 4 people maximum. Note, they explicitly write about ‘XXL bedrooms design’, and this makes me quite confused. There is nothing XXL in the bedrooms unless you downgrade the number of occupants. The total actual width is 280 cm so this gives only 56 cm per person. Even with 4 people this is only 70 cm per person. On the other hand, the living area is more than 5 square meters and it is fully sealed and two people can sleep there when/if necessary. So it is up to you, the tent offers lost of options. I guess this might also be the reason for the word ‘plus’ in the tent’s name. Seasons-wise, this is a tent with a great waterproof rating (more below) and it is very much suitable for any conditions in a 3-season use. Weight-wise, this is a heavy tool, you have 37 lb (16.8 kg). The packed size is less bad, the package is 27.5 x 12.6 x 11.8 inches (70 x 32 x 30 cm). Clearly, this is a camping tent to use at places with a car access. You have already seen a lot, here a few more details about the materials and organization. There are 3 poles for the tent plus one shorter for the front brim, all flexible and lightweight fiberglass. This makes them quite good for winds but this tent would be much better with aluminum poles. The groundsheet is a durable polyethylene with welded seams and therefore fully sewn-in so the tent is completely sealed from the ground. Such a plastic is normally completely waterproof and welding makes the seams stronger than the surrounding material, this is the best way of sealing the seams. The shell is a PU coated polyester with an impressive 4500 mm waterproof rating. It is unlikely you would ever need more. It is also fire retardant so if it gets to fire, it will not flare dangerously and it will self-extinguish. The inner tent is with its own extra bathtub floor so you have two layers underneath the sleeping zone, and the upper part is a breathable polyester and you have mesh section on the back for ventilation. Note that the inner tent is completely removable. It comes as a separate element but when you attach it, leave it attached when you pack the tent. 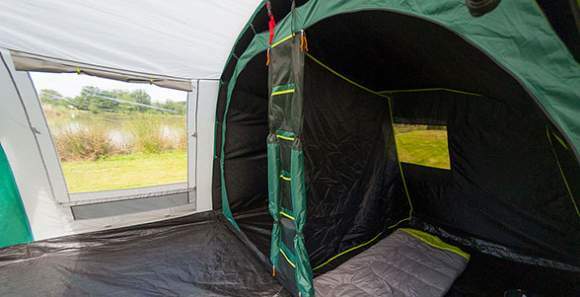 The tent includes a large full-height double-layer front door which can be fully unzipped and rolled up, or you can choose to unzip and roll-up just the outer flysheet, keeping the bug mesh in place. The nice brim/awning on the front makes it possible to keep the door with mesh most of the time, in particular if you orient the tent properly against the rain and the wind. In practical terms, turn the lower and aerodynamic tent’s back in the direction from where the wind blows. Note also that the door is with a drop-down bottom section so you have a totally flat entrance. This is great for buggies and wheelchairs, it is also useful for kids to prevent them from tripping on entry and exit. View through the entry door and front windows from the sleeping area. There are 5 windows here. No less than 4 of them are in the living area and they all are solid PVC. This is a great design and it allows for views on all three sides, but when you want privacy or to reduce the light, you have shutters from inside, so you can close all of them. The fifth is the back window which converts into a vent when needed. You have side zippers on the outer flap so the flap can be rolled up and fixed with toggles or zipped and closed completely with the additional Velcro on the bottom section, or you can use it as a vent. There is a mesh as the inner layer of course. So this is a clever and very functional design. In the living area you have a zippered cable entry point, and between the two inner doors you have an organization element with multiple storage pockets, very useful and functional. You also have lantern hanging points. Very good oversized carry bag. Many pockets & hanging elements. Too small bedrooms for the declared number of users. Weight: 37 lb (16.8 kg) – these numbers are from Coleman directly. Ground dimensions: 157.5 x 122 in (400 x 310 cm). Inner area: 120.5 ft² (11.2 m²). Area per person: 24.1 ft² (2.24 m²). Peak height: 76.8 in (195 cm). Packed size: 27.5 x 12.6 x 11.8 in (70 x 32 x 30 cm). Pitching time: 10 – 12 minutes. In the table below I give this Rocky Mountain 5 Plus tent together with two other tents built in the similar style. It may be useful to see its parameters from this perspective. As you see, it offers less space than the other two tents. Please follow the links to see more. In the summary of this Coleman Rocky Mountain 5 Plus tent review I wish to stress its impressive waterproof rating and the fact that this is a fully enclosed tent. By this I mean the solid windows and the fully sealed floor, and as mentioned you have two floor layers in the sleeping zone. The tent offers quite an amount of space, the organization is great, the blackout design is simply incredible. This is a good value for the money. 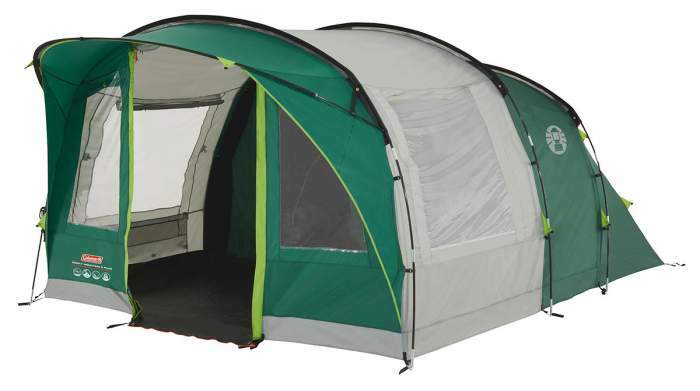 But if you need something much bigger from the same brand, check this Coleman FastPitch Air Valdes 6 XL tent. In the comparison table above I have already given a couple of tents built in the same style, but you might want also to check these Vango Omega 500 XL and Vango Woburn 500 both for 5 people and built in the similar style, and also Eurohike Buckingham Elite 6, and Vango Odyssey Air 600 tents. I wonder if this tent would be appropriate for warmer weather camping. I am interested in a black-out design with good ventilation and fair water-proofing. Hi James, I would say it is better suited for a cooler climate, many tents of this type are on the EU market. Many dark rest (black-out) tents that are also for warm climate are in this list. In particular check some of those from Ozark Trail and also Coleman Carlsbad, you will see them in the list. Thank yoi for the kind words. There seems to be a ton of tie downs. Do you have to have all in place? This is typical for tunnel tents. No, not all of them all the time. But some of those on the front and on the back as essential because this is not a freestanding design. Hi – i just bought and camped with this and it is great. A bit tight closing the doors though. I wonder if you could recommend a good tunnel porch that i can add on? Hi Tony, great to hear about your experience with this tent. As far as I know they do not build a porch for it. Suggesting anything is risky as it may not fit. The closest that might do the job is the porch which they build for the Coleman Granite Peak 4 tent. So get ion touch with the brand and ask for details.